I do love a subscription service. I’ve tried book, make up and razor subscription services in the past and nine times out of ten they work as a time-saving treat delivered by my postman every month or so that I find a use for and come to appreciate. With a growing family and a full-time job, time is something that’s become really valuable and subscription services really help me to claw back some of that precious commodity to do more of the things I enjoy. 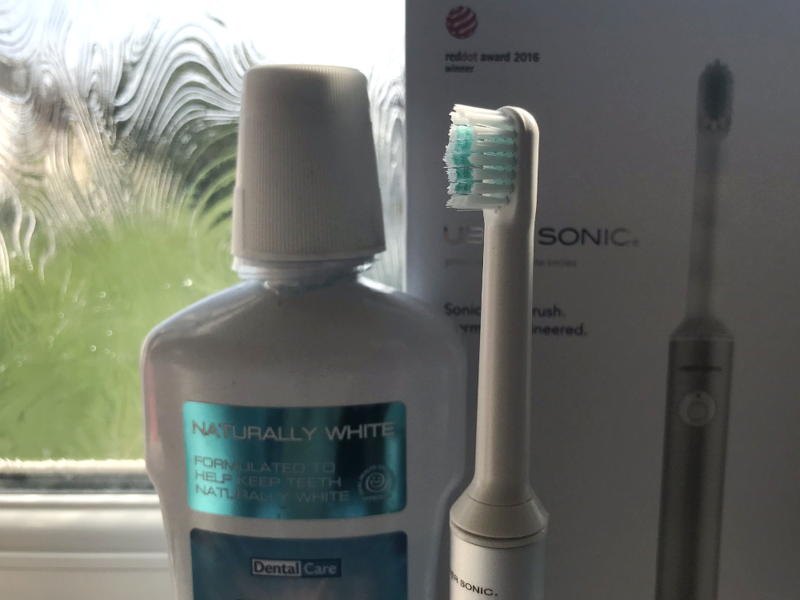 I’ve been sniffing out the Uber Sonic Club toothbrush subscription service for a week now to really give the product a ran for it’s money and – so far – I’ve been loving using it every day. Uber Sonic Club is a subscription service for an ergonomically-designed electric toothbrush for an initial £19 and then replacement heads for a bi-monthly £9 fee. You can choose either the single person, family or large family starter pack that comes with the toothbrush, whitening kit and automatic sign-up to the toothbrush-head renewal program. 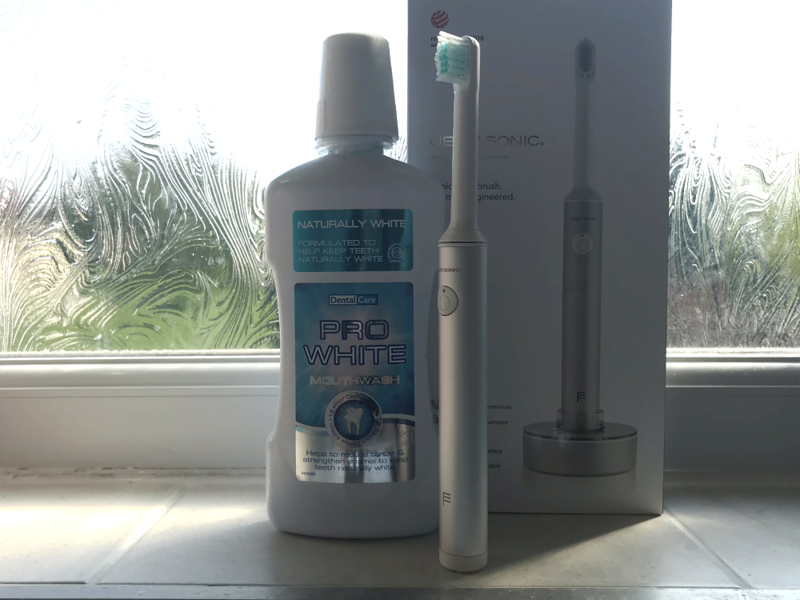 The starter kit on it’s own comes to grand total of £69 so if you decided to sign up for a couple of months and then cancelling it works out as saving – because you can discontinue the service at any time and the toothbrush itself becomes yours as soon as it arrives. I did receive a teeth whitening kit at the same time as this toothbrush as well. It looked like something medical rather than dental and a lot more sophisticated than other kits off of the shop shelves I’ve come across before. I’ve since used it a few times (because teeth whitening just really isn’t my thing, I feel like I’ll turn out like Ross from Friends and everyone around me will need to wear sunglasses just looking at me) and seems to have done the job. It tastes okay and doesn’t take too long but the jury is still out on that one – I found the toothbrush a hell of a lot more exciting to be honest. The makers of this toothbrush describe it as being just like an iPhone 7 in it’s design, and opening up the box really does feel like unpacking an apple product. The toothbrush is a smooth and lightweight silver metal with a cover, a stand and charger all with the box – it feels more expensive than it’s worth. Refill toothbrush head packs cost £13 each for two heads which can feel like a bit too much if you’re just wanting to take advantage of the initial offer and then replace your toothbrush heads as and when – but dentists only really recommend that you replace your brush every three months rather than every four weeks. Personally, I like the incentive of having replacement heads coming through my postbox every two months that help to encourage me to change my toothbrush more often. I have a bad habit of using products like these way past their use (I once used a cheapo razor from the pound shop for two months solid… ) and I do suffer from frequent gum infections caused by wisdom teeth growth-spurts. Cleaning my teeth each morning and evening using this electric toothbrush feels like a treat, because it looks and feels so premium. It looks incredibly swish standing on the windowsill in my bathroom and my husband pretty much swiped this as soon as it arrived so it’s a good thing I don’t mind sharing. The only thing I find with this toothbrush is that I have to really work at using it because it’s effectively just a vibrating brush head, without any individual bristles action that the more expensive products out there do so well. I described this to a friend the other day as a perfect travelling electric toothbrush because it’s so light, it doesn’t need charing very often (I haven’t had to even plug it in for a whole week) and it comes with it’s own plastic covering as well as replacement head when you need them so there’s no worry of a used brush breeding bacteria when it’s packed away still damp. Have you tried this toothbrush subscription service before? What did you think of it? Let me know in the comments. This post contains PR samples. All thoughts, opinions and experiences are my own.